I am a PhD student in the LOPS department at Université de Bretagne Occidentale and Ocean Science department at Bangor University. My work is focused on ocean stratification in the Barents Sea and how it is affected by sea ice. I have been using satellites data to improve our understanding of the polar front, a feature that is important for the formation of Arctic Intermediate Water. 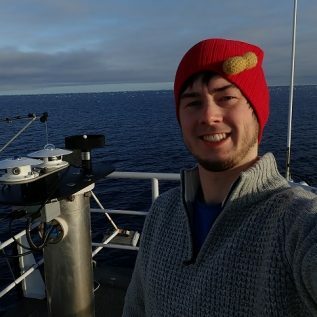 My recent contributions to the efforts of the PEANUTS group have been through my participation in an expedition into the Beaufort Sea, north of Alaska during September 2018. Here we collected water samples along the continental shelf and around the sea ice edge, along with measurements of turbulence. We will combine these measurements to determine nutrient fluxes in this region.